The universal iOS app for iPhone and iPad Clothing Assistant helps you choose, launder, and properly care for your clothes. It’s like having Martha Stewart and Tim Gunn on speed dial. Clothing Assistant has a simple, no frills interface. You navigate between four categories via icons at the bottom of the screen. When you touch each icon, a list of details appears. When you touch the relevant detail, more information unfolds. The graphic sensibility is French country–up to and including–the frilly script font. It’s certainly attractive, but perhaps an easier-to-read font would be a better choice. This is a minor issue, as the content is excellent and organized nicely. 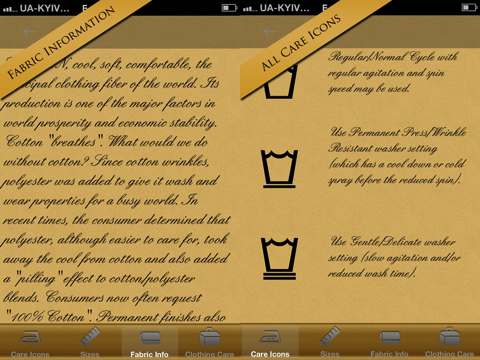 The universal download covers laundry care, sizes, fabric info, and clothing care. European laundry care icons are deciphered and translated for you. Now, you know the appropriate temperatures of water, what needs to hang dry, and what should be dry cleaned. European, English, Japanese, and American clothing sizes and shoe sizes are compared in a quick chart. These are incredibly helpful. It is common to encounter products from all over the world when you shop in traditional brick and mortar locations, as well as online. The fabric info category will probably not be the most useful part of Clothing Assistant unless you sew. If you sew, you’ll love all of the details about different fabrics. Finally, the clothing care section is amazingly thorough and resourceful. There are basic Laundry 101 topics covered, but Clothing Assistant helps you defunk your stinky silk and clean the grimy film from your iron. In a tone that sounds like you’re talking to your neighbor, the tips and tricks are described concisely. Clothing Assistant is a $1.99 universal download. I would typically expect more sophistication for this price tag, but the tips, tricks, and hints will help you earn back this investment quickly. As a laundry nerd and mother of five boys, I know about laundry. A common week includes 15-20 loads of laundry. I have worked on every stain imaginable. With Clothing ASsistant, I feel like I am in good hands to keep the hand-me-downs in perfect condition. 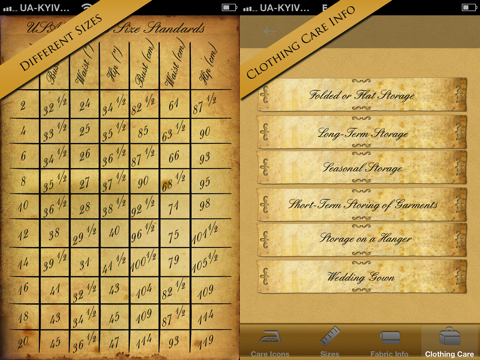 AppSafari review of Clothing Assistant was written by Jenni Ward on March 22nd, 2012 and categorized under App Store, iPad apps, Reference, Universal. Page viewed 4896 times, 1 so far today. Need help on using these apps? Please read the Help Page.